Attention to the material cultures of the eighteenth-century log-book and journal reveal that media of navigation, through which to imagine distant, and not proximal, relations, might not be as remote as we would like to think. 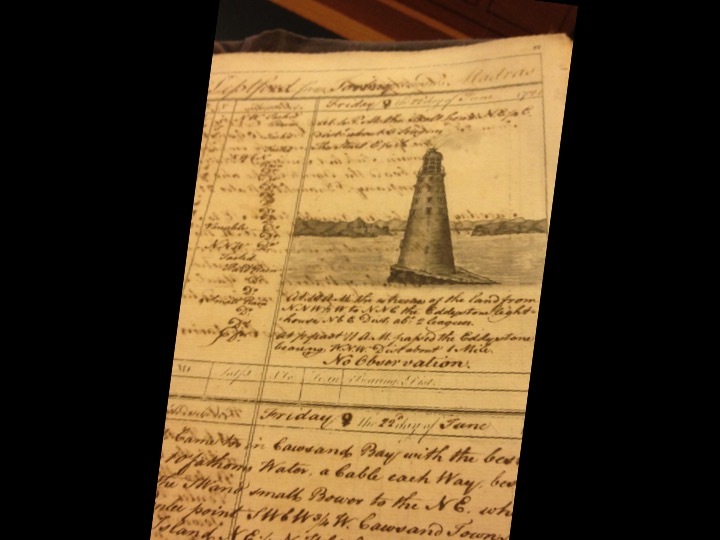 The material cultures of seafaring I discuss in this brief paper are those artifacts of onboard ship writing, the log books and journals that eighteenth-century mariners kept. These logs and journals mediated, we might say, two distinct sets of relationships. First and foremost, they oriented sailors to their location, functioning as a medium for tracking a ship’s movement through oceanic space. Yet second, of course, they became the record that mediated the relationship between those aboard ships and those on land, a means for those on shore to apprehend the situation and sometimes selves of their far-flung compatriots, a way of bringing sailors and their distant experiences at sea home, as it were. I mean this language of mediating distances between sailors and those distant from them to echo, slightly, the language of moral sense and sympathy (recall Adam Smith’s claim—that we are affected by another’s agonies when they are “brought home to ourselves”). For these artifacts and their own movement and mediation offer suggestive occasions for sympathy—in the repetitive meteorological phrases that travel from the journals and logs into other forms of writing, in odd moments of personalization, and, in the journals of the well-known sailor-poet William Falconer and the less known Richard Blechynden, in original poems or quotations of sentiment. Sailors used the log board for identifying their location—first and foremost to themselves—within the vast expanse of the sea. It was the means by which they navigated via dead reckoning, “the judgment or estimation which is made of the place where a ship is situated”, it is “discovered,” as William Falconer notes in his popular and authoritative An Universal Dictionary of the Marine, “by keeping an account of the distance she [the ship] has run by the log, and of her course steered by the compass.” Crucially, the log helped sailors rectify their sense of the ship’s location based on these data, in part, by their also recording there “drift and leeway,” the movement of the ship off course due to wind and weather. 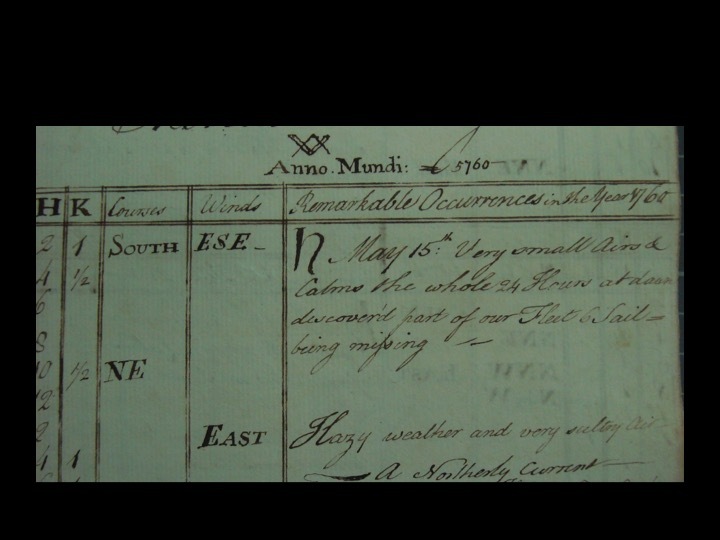 It is for this reason that log-boards (and log-books, as I shall discuss in a moment) record not only the log-derived speed, and the compass-given direction, but also wind directions, in a separate column, and constantly note, in the “remarkable occurrences” column, wind and weather conditions, such as “fresh gale,” “steddy [sic] gale,” “decaying” winds. (Image 1). 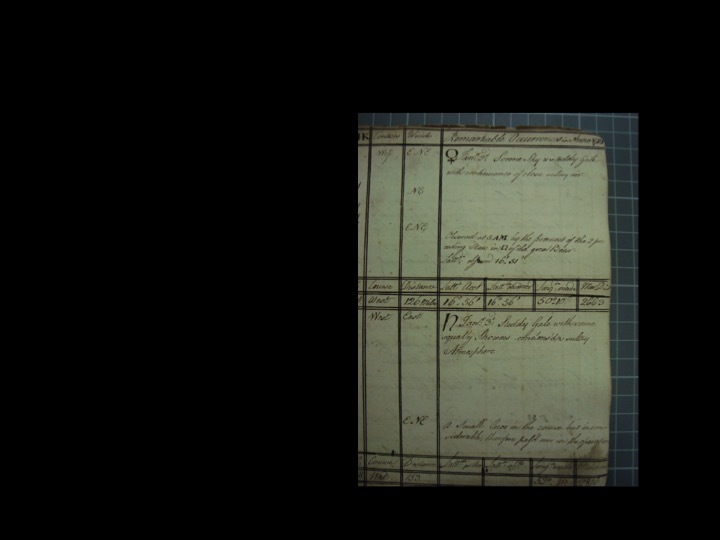 Within the log-board and log-books sailors use the wind direction and estimated strength to correct their estimation of the ship’s course and location, on log-book noting, for instance, that the ship has probably undergone ”6 points drift to Leeward,” for instance (Image 2). Even at this level of documenting for the purposes of navigation, another form of mediation was taking place. As Falconer notes in his Universal Dictionary of the Marine, the initial recording of the log-derived speed was entered into a “log-board, a sort of table, divided into several columns, containing the hours of the day and night, the direction of the winds, the course of the ship and all the material occurrences that happen . 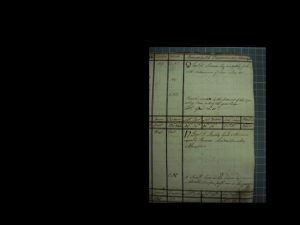 . . from noon to noon, together with latitude.” This information was copied into the log-book, but at that point it also furnished the material for “the different officers of the ship . . . to compile their journals, where they insert whatever may have been omitted; or reject what may appear superfluous.” In these journals, sailors made their own estimates of the impact of wind levels and weather on the course and consequent location of the ship. 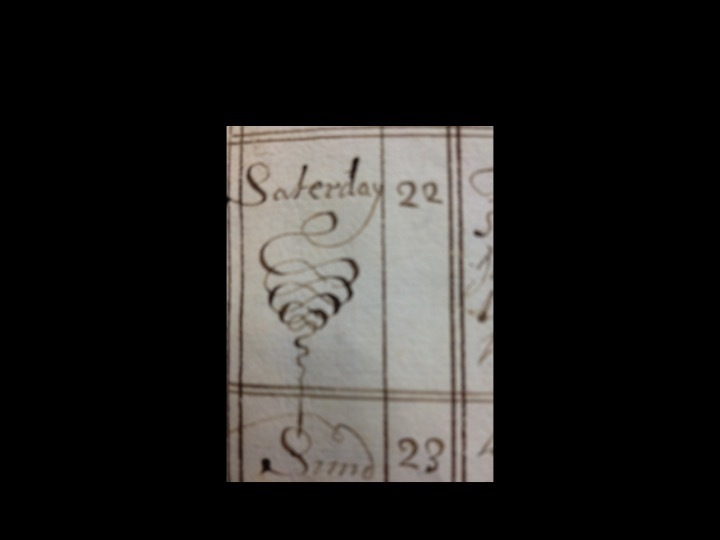 Their interpretation of the influence of the wind and weather on the ship’s course could thus vary widely, as could their resulting sense of the position of the ship recorded in their journal. As N.A.M. 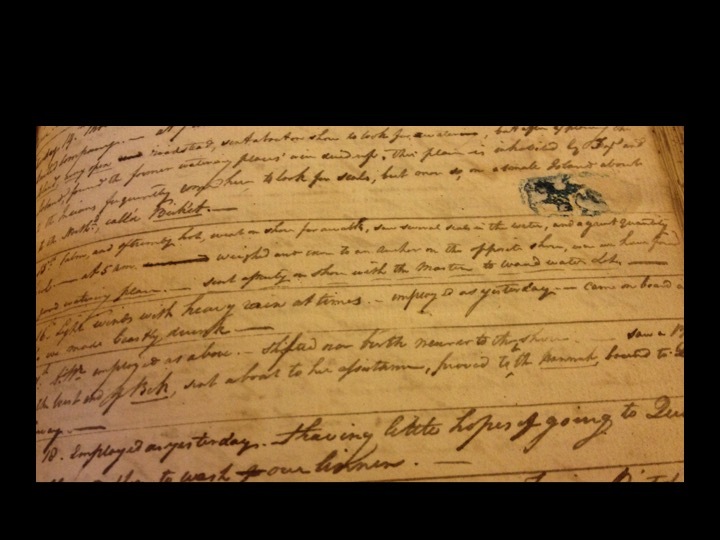 Rogers notes, “A passenger in a Dutch merchantman sailing form Cadiz to Ostend in 1743 was alarmed to discover after a fortnight at sea that the two mates differed 150 miles in their latitude, one placing the ship north of the Scilly Isles, the other south.” So, one log-book informs a range of journals in a movement between a singular, collective navigational set of data, and multiple individual interpretations of that data and separate accounts, adding, subtracting, and even inserting the self, at times, into their respective journals, as I shall explore in more detail in a moment. 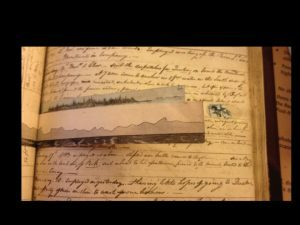 A series of mediations, from instrument-derived information to log-board, log-book, and individual journals, takes place, yet little mediation occurs between those individual journals, each writer compiling his own in isolation from other crew members. Log-books and journals are tools for the sailors themselves to comprehend—or more accurately, estimate—their place in space in the present, via a series of past recordings set in relation to that present, in surprizing isolation, however, from other journal writers aboard the ship. 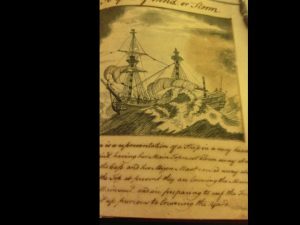 But they are also, in part, directed toward others—future, distant others—a reader, say at the admirality in Greenwich, who might read these texts upon the ship’s return or captains consulting the journals for navigation information after they have been deposited in the Public Records Office. N.A.M. Rogers cites one such consulting figure, who writes, “ ‘we frequently when we are going voyages where we have never been get journals out of the public offices for our guide and direction.’ ” We see a keen, if uncomfortable, awareness of that potential future reader in one journal in which untoward material is covered up—a “remarkable occurrence” that notes “came on board an Indian we made beastly drunk” (Image 3). Pasted over this entry is a piece of paper with a demure drawing of the coastline, returning the journal to the mediation of space for which it might be consulted (Image 4). This literal cover-up anticipates (and mediates) the journal’s movement—to other hands, other readers, in the future. Log-books and journals moved outward, to other readers, in less literal and physical, ways too. 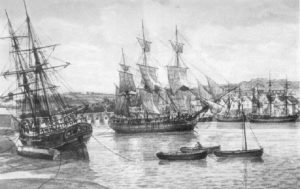 They help structure the form and content of the accounts of voyages that appeared in increasing numbers in eighteenth-century Britain. Significantly, the very language of log-books and journals, particularly the vocabulary of wind direction, wind force, and weather conditions, moves to the print voyages, part of the representational economy of the prosaic and material that mediates the experience of distant sailors for general readers. 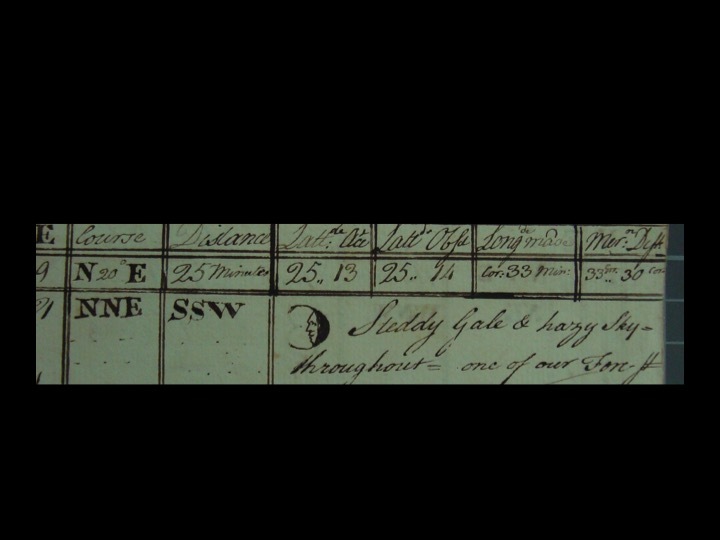 Not surprisingly, voyage narratives, such as those of William Dampier, are filled with such language, as in “The 21st day we went from thence with a moderate gale of wind SW. In the afternoon we had excessive showers.” Including technicalities of wind direction and force helped provide a sense of a transparent record of an empirically observed and measured, if quite distant, world—a formal mechanism that might turn readers into “virtual witnesses” of a sort. 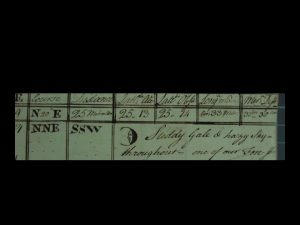 Dampier himself is not following the Royal Society’s “Directions for Seamen, bound for far Voyages” and their request that seamen “keep a register of all changes of the wind and weather at all hours . . . the point the wind blows from and whether strong or weak; the rains, hail, snow . 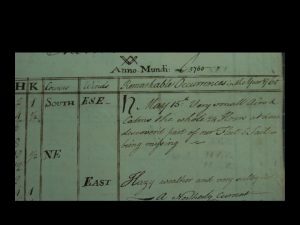 . . and above all to carefully observe the trade-winds.” And yet his and other published voyage accounts repeat the recordings of wind and weather, the information that comprises so much of the log and journal, bestowing authenticity and valued information on their accounts. Less predictably, the log and journal language of wind and weather also move to prose fiction representations of the sea. Robinson Crusoe’s initial observation upon going on board a ship for the very first time is “the Wind began to blow and the Winds to rise.” And Defoe’s Captain Singleton stocks his narrative with descriptions such as “After sailing on NW and N with a fresh gale at SE . . . we were surprized with very bad weather, and especially violent rains.” Tobias Smollett’s Roderick Random tells us how “the storm subsided into a brisk gale” and later “we beat up to windward with fine easy weather.” These “log-language” moments no longer serve the purpose of orientation in space. Here the information, decoupled from such navigational purposes, becomes a reality effect that helps render the distant proximal, mediating life at sea for remote readers. Recordings of wind and weather in particular to conjure life on board a ship increasingly registered meaning even beyond mere reality effect, the mediation of distance promised in such recordings moving from figural to literal connection between the remote figure at sea and the reader. 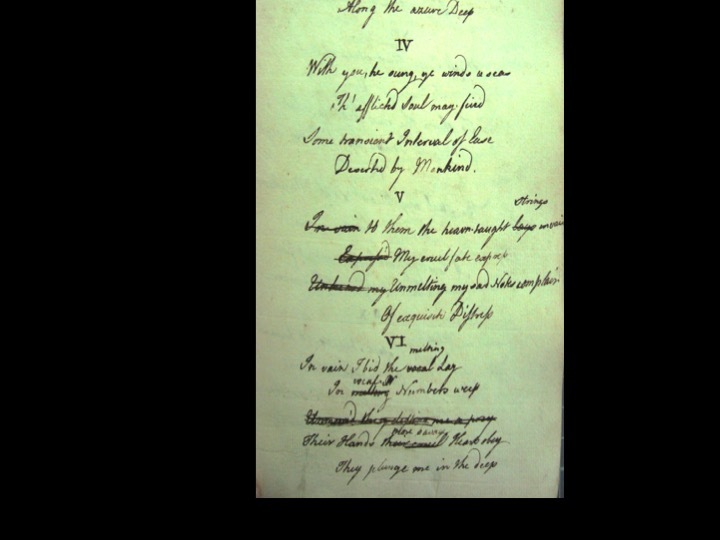 William Falconer’s immensely popular poem The Shipwreck translates the language of weather into a Georgic poetics, as in lines such as “More southward still the increasing breezes veer./And, o’er the horizon, lybic clouds appear” (ll. 326-7). Yet his drawing from wind and weather recordings reflects not an effort to seem to represent transparently distant experience at sea but rather to promote new conceptions of weather’s role in mediation and communication between sailors and readers, especially on an affective dimension. Critics have begun to explore representations of weather itself as a mediating force. With these new conceptualizations, as Mary Favret writes, “Intimations of change over time and at a distance could be transmitted, felt, through the weather.” Favret goes so far as to argue that “Human beings suffered, and suffered in sympathy, the pain of an inexorable, even mechanistic weather on a global scale.” Thus, the sailor speaker of Falconer’s poem articulates his suffering with the weather: “Ye tempests ov’r my head congeniall roll/To suit the mournful music of my soul” (ll. 9-10) and hopes to make this a sort of “suffering in sympathy,” his aim, as he puts it, “To wake to sympathy the feeling heart” I. l. 650). Here, the weather is the mediating point between sailor and English reader, in what might seem a surprizing reworking of the language of the log and journal, in their dutiful recording of wind and weather, into a touching language of affect. While Favret argues that it was only in the later eighteenth century that weather came to be seen “as a global system of exchange, something that passed from one region to another over local and national borders,” mariners had long understood weather in these terms, the quality of wind indicating the remote direction from which it came, helping early sailors orient themselves in space, for instance, or known trade winds moving between and moving ships from one locale to a distant one. In his sailor’s awareness of movement of weather, Falconer’s sailor invites: imagine the northern wind or tempest to imagine the state of my mind, suggesting that weather moves figuratively and, as part of a global system, literally to readers. This mediation takes its most legible form as an appeal to sentiment in a poetic work like Falconer’s The Shipwreck, but such attempts are not limited to poetry, for we find evidence of the sentimental individual on the pages of journals themselves. As Jonathan Lamb succinctly and insightfully puts it, “the histories of sympathy and navigation are closely entwined.” Attending to the material cultures of log-books and journals suggest that it might not only be, as Lamb argues, representations of mariners in peril (as in Falconer’s Shipwreck) or beached mariners, whose “encounters with native peoples” provided them “their own opportunity to join in sympathetic exchanges” that offer occasions of thinking about this relationship between sympathy and navigation. 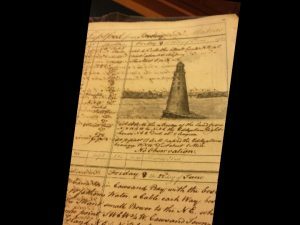 The journals of ship-bound sailors too, a medium seemingly drained of sentiment, with its columns, numbers, and technical weather terms, might also tell us something about that entwinement. The language of sentiment and sympathy is not merely a rhetoric I am imposing on these artifacts, but is explicitly recorded within their pages—another page from Blechynden’s journal (Image 12) cites the poetry of Shenstone, “Whoe’er has travelled life’s dull round,/Where’er his stages may have been,/May sigh to think he still has found/The warmest welcome at an inn,” and Pope’s “Blessed is he who expects nothing, for he shall not be disappointed”, assembling motifs of outsiderness and privation. A cut out of a print memorial to the Duke of Gloucester. 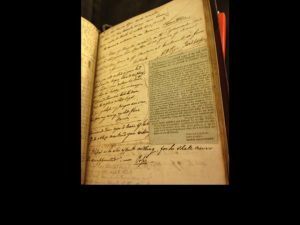 The journals fall into the hands of collectors, who view them as sentimental objects, sometimes adding their own material. 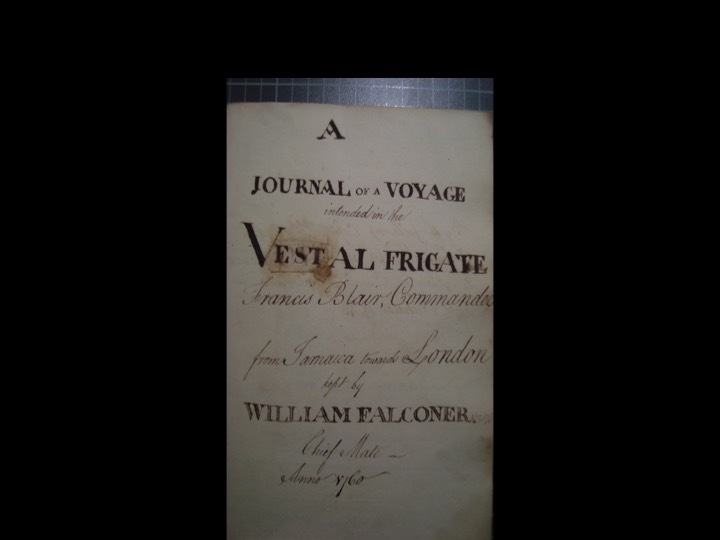 We see the dynamics of navigation and sympathy in full force in the 1760 journal of Falconer’s Atlantic voyages. While it is not surprising to find moments of sentiment in the journal of this poet, as the other journals suggest, the moments of sentiment are not aberrations. 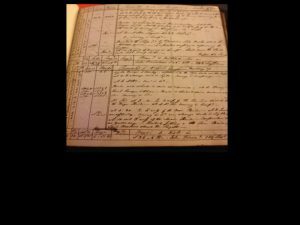 Falconer’s journal offers both the uniform representation of log information (Image 13), including the quotidian recordings of distance travelled, latitude, longitude, speed (knots) course, winds, and, most often, weather conditions. Yet its opening pages, suggestively, feature drafts of a poem regarding “smooth zephyrs,” deploying that sympathetic economy of weather, as well as a drafts of a letter to a patron, trying on different terms in a calculation of those most likely to induce a sympathetic response. 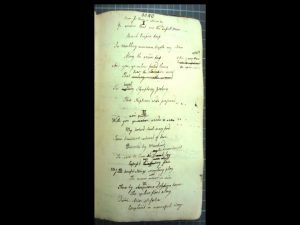 Falconer’s journal devotes page after page to revisions of his sentimental poems, mainly to absent lovers. His language is that sentimental lexicon of throbbing and burning bodies. “My soul all melting . . . enflamed my bosom glows,” he writes in one draft. 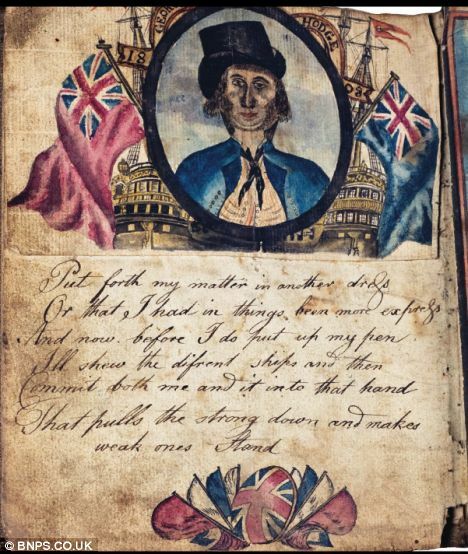 In some of the writing the sailor’s body in particular becomes a legible—and audible—sign of sentiment; He is weeping man, and “His looks confess’d a votary of the main/And conscious grief awak’d the mournful strain.” In another poem, the poet speaker’s “mournful strain” finds a match and sanctuary in the wind; Stanza IV reads: “with you, he sung, ye winds and seas/Th’afflicted soul may find/Some transient interval of Ease/Deserted by mankind” (Image 14). In another stanza, the wind conveys the poets strains across great distances—Stanza I reads: Ye winds that o’er the vassal Main/Eternal Empire keep/In trembling murmurs breathe my strain/Along the azure deep” (Image 15). Finally, the sentimentalization of the writing subject and that writing’s projected movement across great distance sit oddly (if also predictably, for those familiar with eighteenth-century conceptualizations of sympathy) beside the log recordings of the world immediately surrounding that subject. The recordings remain bereft of sentiment and sympathy, even when they mention the sad fate of those onboard ship with them. 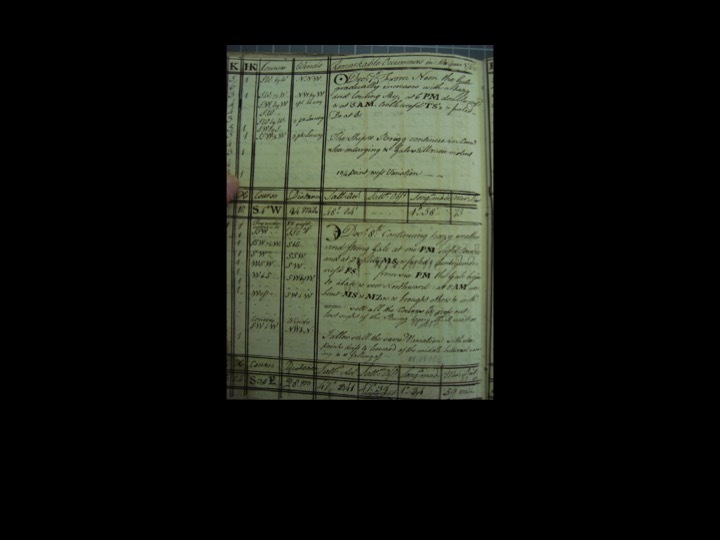 Logs will record the purchase of “negroes,” slaves, alongside the repairing of the ship, or they will note a sailor’s death and move to wind conditions without missing a beat. 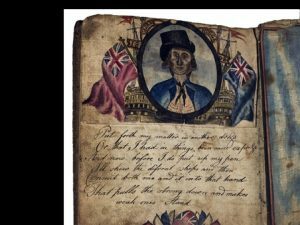 Blechynden’s journal entry for May 1804 reads “fell overboard and was drowned Bevis, not a material loss to the service—hazy weather” (471). Fellow feeling for those close is nowhere to be found; it is someone or some place at a distance with whom the journal writer seeks or imagines sympathy, mediated through wind and weather, remote and yet feeling. And here we find, perhaps an odd parallel to our own sense of logging on (first recorded in 1963) in the individual oblivious to those physically near, imagining connection, instead with remote others, via technology. 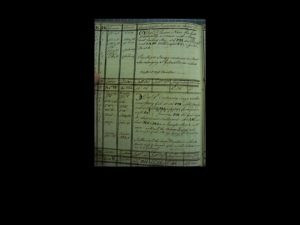 Attention to the material cultures of the eighteenth-century log-book and journal reveal that media of navigation, through which to imagine distant, and not proximal, relations, might not be as remote as we would like to think. 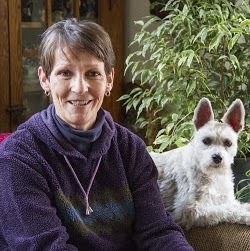 D.D. Raphael and A.L. Macfie, ed., The Theory of Moral Sentiments (Oxford: Oxford UP, 1979), 9. Taylor, Haven Finding Art, 201 and Bourne, A Regiment for the Sea (London, 1574) cited in Taylor, Haven-Finding Art, 201, respectively. Falconer, A Universal Dictionary of the Marine (London, 1769). Falconer, A Universal Dictionary of the Marine. The Wooden World: An Anatomy of the Georgian Navy (Annapolis, MD: Naval Institute Press, 1986), 47. A Collection of Voyage in Four Volumes Containing I Captain William Dampier’s 4 Vols., v. I (London, 1729), 4. For a description of the virtual witness in scientific discourse see Steven Shapin and Simon Schaffer, Leviathan and the Air-Pump: Hobbes, Boyle, and the Experimental Life (Princeton: Princeton UP, 1985). Daniel Defoe, The Life and Strange Surprizing Adventures of Robinson Crusoe ed. Michael Shinagel (New York: Norton, 1994), 7. Defoe, Captain Singleton, ed. Shiv Kumar (Oxford: Oxford Worlds Classics, 1990), 33. Smollett, Roderick Random ed. Paul Gabriel Bouce (Oxford: Oxford Worlds Classics, 1981), 165 and 419, respectively. Roderick also describes the weather, “a deluge of rain falls” just after describing the dead soldiers, thrown over the ship, and now littering the harbor in Carthagena (189). William Jones, ed., A Critical Edition of the Poetical Works of William Falconer (Edwin Mellen, 2003), 170. War at a Distance (Princeton: Princeton UP, 2010), 134. War at a Distance, 138. A Critical Edition of the Poems of William Falconer, 163 and 279, respectively. War at a Distance, 131. Preserving the Self in the South Seas, 1680-1840 (Chicago: Chicago UP, 2001), 250.
http://i.dailymail.co.uk/i/pix/2008/08/14/article-0-0246371A00000578-996_468x554.jpg, accessed 5 May 2015. 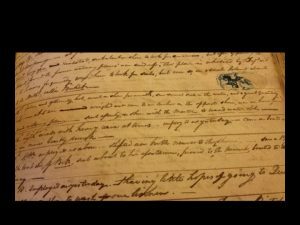 Richard Blechynden Journal 1780-1781, British Library Add MS 45578. 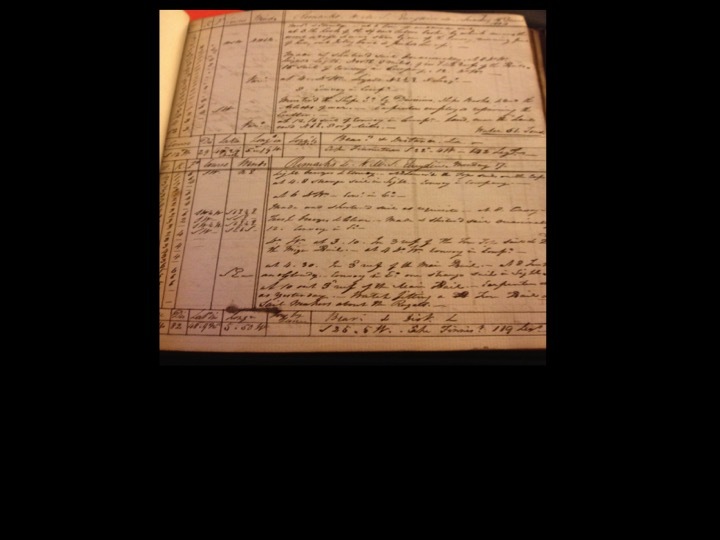 William Falconer Journal 1760, Caird Library, National Maritime Museum, Greenwich BRK/13. 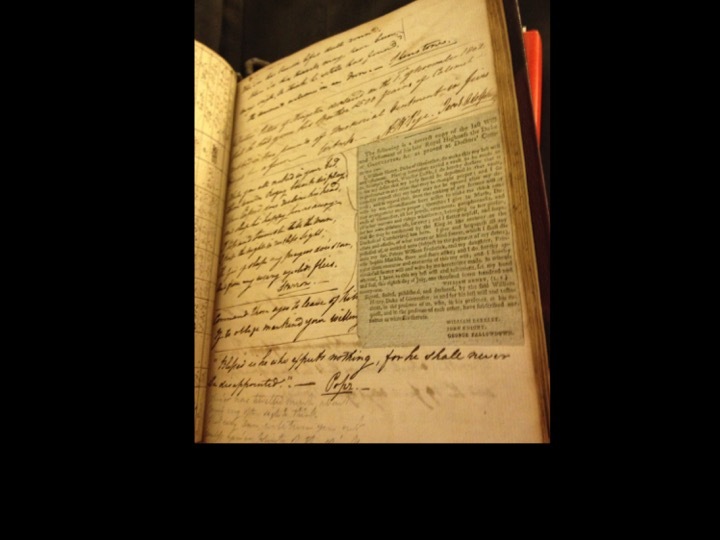 Blechynden Journal, 1804, British Library Add MS 45581. This entry was posted in Art History, History, Maritime. Bookmark the permalink.